Buy Power Grid and PriceWatch, Buy this board game at the Lowest Price. 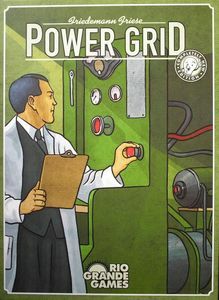 Power Grid is a strategy board game designed by Friedemann Friese and is a remake of the German board game Funkenschlag. Each player represents a power supply company trying to connect as many cities as possible to its power grid. To do so, you will have to build power plants to supply enough electricity to power your cities; own enough resources to run the power plants; and earn enough funds to connect the cities and buy the power plants and resources. A new power market has opened up and everything is up for grabs. Compete against other power suppliers as you work your way towards becoming the biggest power supplier in the land. Build power plants and control the market for raw materials such as garbage, oil, coal and uranium. Connect cities to your power grid before others do and become the greatest power magnate! There is an order to the bidding process. The player with the most connected cities each round get to bid for power plants first. However, this is balanced by the fact that they will be the last to buy raw materials and connect cities. Buying raw materials involves grabbing coal, oil, garbage or uranium from the board at their current price. There is a raw materials market that changes depending on supply and demand. The materials replenish at a fixed rate each turn, and are consumed by players using the related power plants. The more of each material is available, the cheaper it is. Power Grid is mainly about efficiency and strategic planning. The goal is to power as many cities as you can, and the player who is the most efficient and can do it the fastest will win. Also, how much are you willing to bid for that attractive power plant? Should you spend your limited funds connecting choice cities first or overbidding for that new power plant? Is it worth it to spend a bit more to connect to distant cities in order to cut other players off from a city network? Should you target cities in cheap but congested networks or go for the isolated expensive ones? These are questions you need to always keep in mind, and the answers will change depending on how your opponents play as well. The game also has expansion boards and power plant sets. New boards include France, Central Europe, China and Korea, and each introduces interesting aspects to the game. For example, the order in which power plants are revealed in the China game reflects the country's planned economy. Similarly, there are 2 resource markets in Korea to reflect the separate North and South economies, and the North Korea resource market doesn't have uranium (right…). Overall, Power Grid isn't too challenging a game to learn. The mechanics are pretty straightforward and easily grasped, though it might take time to master the efficiency and fund-allocation required to be really good at it. The game takes just over 2 hours, and is one of few games that can play up to 6 players without losing its appeal or taking too long.